Upvc Roofline Replace your old and tired timber fascias and soffits with upvc roofline, maintenance free, hassle free. 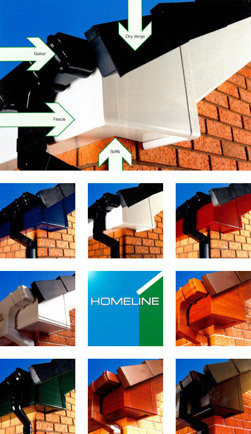 Choose from upvc guttering to aluminium seamless guttering. We replace all old timbers and guttering rather than covering over the existing timber, which can lead to problems in the future. We only install “Homeline”, one of the largest manufacturers of roofline systems in the UK. It carries both BBA and BSI accreditation. Our installations carry a comprehensive guarantee for 10 years on all coloured foiled products and rainwater goods or 15 years for white soffits and fascias. Windows 4 U also provide a full cladding replacement service, available in a variety of colours. If your home has old timber Tudor boards that have started to decay Windows 4 U can replace them using high quality upvc Tudor replacement board restoring your home to its former glory. Say goodbye to old rotten timber and annual painting to hard to reach areas, choose new roofline products from Windows 4 U and never need to worry again.